Vehicle owners are pretty good at spotting and responding to emergency-level auto repairs. If their car blows a tire, they understand they need to get it replaced, or if the vehicle won’t start, they know there’s something drastically wrong with the engine. Somehow, this auto repair logic doesn’t apply to regular maintenance; and people often forget, neglect, or procrastinate bringing their car in for a tune-up, thinking it’s unimportant. This couldn’t be further from the truth. Tune-ups aren’t costly, nor are they required on any basis more frequent than “periodic.” For most cars, every six months is plenty (though older vehicles may benefit from more frequent visits). It doesn’t take long or cost much to check your fluids, examine the overall health of your vehicle, and either make small direct repairs or make recommendations for larger fixes. These checks, tweaks, and modifications may not seem like much, but they can help prevent the onset of bigger, more damaging, more expensive repairs down the line. If you’re in the habit of skipping these tune-ups, your car will eventually start showing signs of that neglect. When your car stalls once, it may not seem like a big deal—but imagine your car stalling at a pivotal moment, such as at a busy intersection, or on the highway. Stalling has a number of potential root causes, from bad spark plugs to a clogged oil filter, and almost all of them can be prevented or treated with regular maintenance. Stalling isn’t just annoying; it’s dangerous, and it’s your responsibility as a safe and reasonable driver to do everything you can to keep your car in safe, working condition. 2. Difficulty starting the engine. Difficulty starting the engine could be a sign of a number of problems, all of which can be prevented (or at least identified) by a proactive tune-up. For example, it could be that your spark plugs are misfiring and preventing your engine from turning over. Replacing one of these is simple and doesn’t take long or cost much. It could be that your battery’s at the end of its life and ready for a replacement; another simple, inexpensive repair. A tune-up will help you catch these problems early, so you never have to face the dread of an engine that won’t turn over. 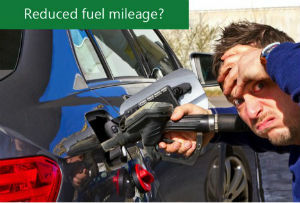 Fuel mileage is hard to monitor unless you have a gauge for it in your vehicle, but you should be able to tell when there’s a significant drop. Your vehicle’s fuel economy depends on a number of interrelated factors, including the efficiency of your emissions system, the smooth operation of your engine, and even the way your car drives; for example, poor wheel alignment can negatively affect gas mileage. As this can be an indication of many different problems, it’s imperative that you bring your car in for that overdue tune-up whenever you notice a decline in fuel mileage. 4. Strange or new noises. Are you hearing any strange or unfamiliar noises when you drive your vehicle? Some of them may be innocuous, but more often, these are indications of new problems with your vehicle. For example, that clunking noise could be something loose, and that squealing noise could be an indication of low fluids. Your vehicle depends on a series of interrelated moving parts to remain functional; when one of those parts is damaged or loose enough to cause a noise, it’s only going to get worse until you get it taken care of. When driving your car straight down a sparsely populated highway, loosen your grip on the steering wheel for a moment. Does your car continue to travel straight, or does it list gently in one direction over the other? Naturally, your vehicle should travel straight if not being steered. If it doesn’t, it means your wheels are out of alignment, which is bad for your fuel economy, as well as your ability to handle the vehicle. Wheel alignments are traditionally covered in vehicle tune-ups, so get this problem fixed as soon as possible. Your brakes are one of the most important safety features of your vehicle; they need to be functional, responsive, and strong to be effective. The problem is, you never know when you’re going to need that extra braking capacity, and since brakes decline gradually, it can be hard to notice when they’ve surpassed the safety threshold. Getting your car in for a regular tune-up will help you identify when your brakes need serviced; by the time you realize your brake performance is declining, you’ve already put yourself in potential danger. 7. There’s a warning light on. If there’s a warning light on, it’s probably an indication that you should have gotten a tune-up a while ago, but more importantly, it’s a reason to bring your car into an auto repair center immediately. The problem here is that most people don’t take their check engine lights very seriously. They may see it come on, but if they don’t see an associated behavior, such as smoke pouring out from under the hood, they falsely believe they have an indefinite amount of time to sort out the issue. As we’ve seen already, most problems only get worse with time, so if you see any warning lights, bring your car in for auto repair immediately. There’s no excuse for not bringing your car in for regular tune-ups; if you encounter these signs, it’s an indication that you should be more proactive in your everyday car repair. Even if you’re budget-conscious and worried about the costs of regular maintenance, you need to understand that this is a far less expensive option than procrastinating and allowing more destructive problems to set in. If your car is overdue for maintenance, one way or another, bring it into The Garage Auto Repair—you’ll be glad you did.